We go that extra mile. DC Recovery started as a small family business in 2006. 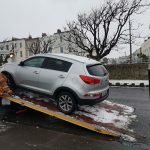 Due to the dedication and hard work of the company directors Damian Murphy and Dean Murphy, Dublin City Recovery has built a reputation as one of Dublin’s most popular car recovery and roadside assistance companies. We have various tow trucks and breakdown vehicles throughout Dublin at all times.